Opening Song: Do You Know What Time It Is? Book: I Want to Be an Astronaut by Byron Barton. This is a nice, simple introduction to many of the things astronauts do. Big, bright pictures makes this an excellent book for sharing with a group. We talked about the things astronauts were doing, why astronauts wear suits (to protect them in space), counted how many were in the crew, etc. Book: Exploring Space with an Astronaut by Patricia J. Murphy. I didn't read this book word for word, but we looked at many of the photos and talked about what was going on. I liked using a book with photographs to reinforce some of the concepts we talked about in our first book of the day. We talked about the suits that astronauts wear, the kind of work they do, and what living on the spaceship is like (no gravity!). Song: If You're Going to the Moon, Wear Your Boots from Mel's Desk. The kids were a little squirrelly at this point, so I had them stand up and we put actions to the words (thump chest for "suit", stomp feet for "boots", clap hands for "gloves", tap head for "helmet"). Book: Every Planet Has a Place by Becky Baines. I like this simple, nonfiction book because it presents the planets in a very simple way AND it has Pluto correctly classified as a dwarf planet. I was surprised at how many planets the kids were already familiar with! We talked about how the sun is a star and how the planets orbit around the sun. Along comes another. Then there are two. Two shiny spacecraft speed through the galaxy. Another blasts off. Then there are three. Three shiny spacecraft ready to explore. Along comes another. Now there are four. Four shiny spacecraft soar and dive. Along comes another. Now there are five. Five shiny spacecraft are coming home soon. What an adventure they had on the moon! by Diane Thom, found in Transportation Theme-a-Saurus (Totline Publications, 1999). 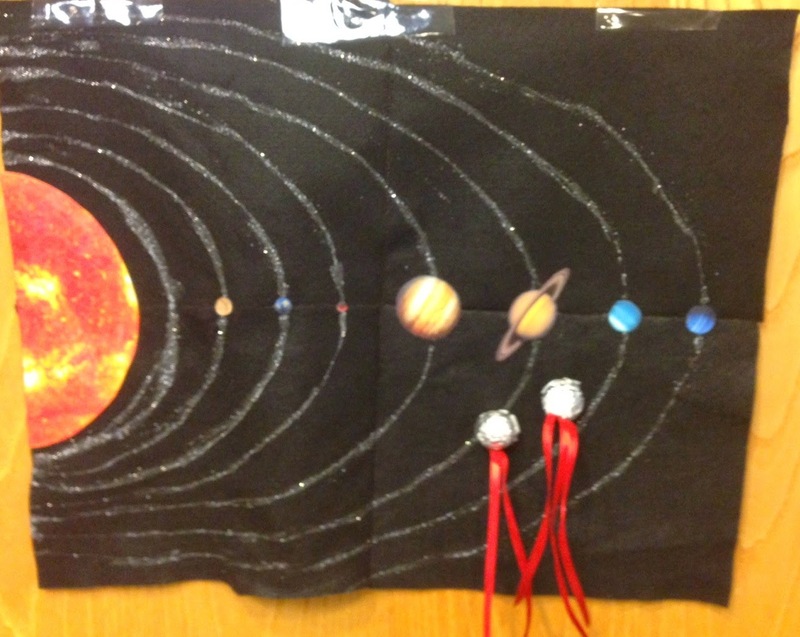 Felt Activity: Things You See in Space. 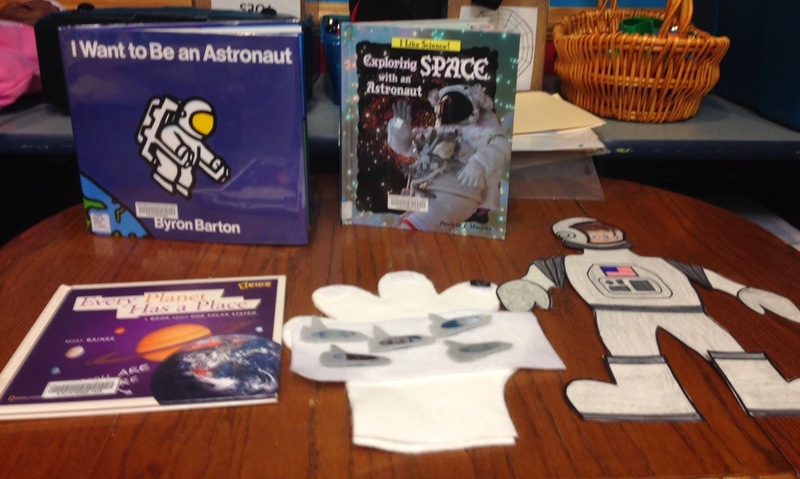 We have a set of "space things" (rocket ship, astronaut, moons, stars, telescopes, etc.) and I passed one out to each child. When I called their picture, they could come up and put it on the board. Activities like this not only provide an opportunity for kids to get up and move around, they get kids familiar with coming up to the front of the room and approaching an adult who is not their parent (me! And someday a teacher!). This activity also provides practice with listening and following instructions. 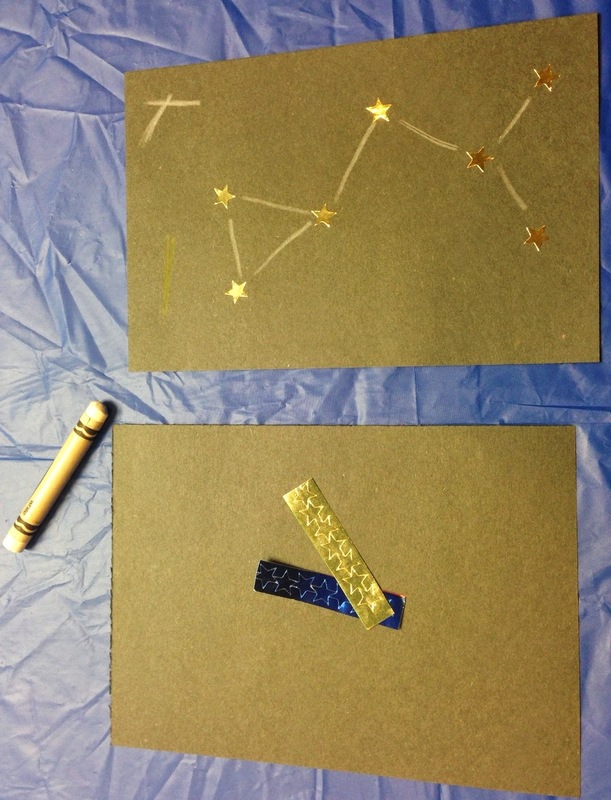 Star/Constellation Pictures: I put out half-sheets of black construction paper, star stickers, and white crayons and the kids could make their own constellations. Some kids made the letters in their name, some stuck all the stars on the page and made them into comets or drew planets with the white crayons. This was an easy, cheap craft that did not require a lot of prep work. Sticky Table, Design a Universe. I used the sticky table before for our Growing Things Preschool Lab. I put down some black bulletin board paper on the table first and voila! A space scene! Volunteers used our die-cut machine to cut out stars and hand-cut "planets" and the kids went to town placing them on the sticky table. When kids are done, the pieces can be removed and ready for the next kid. This is a good sensory activity, too. Comet Toss. Miss TS had already created this comet toss game for a couple of programs earlier in the summer and I borrowed it. The kids had fun throwing the comets to see where they would stick in the solar system. Space Floor Puzzle & Felt Board. We have a Melissa & Doug space floor puzzle in our Space Theme Box and I borrowed it for this program. This was a nice activity to have out since I had a bunch of older siblings today and this gave them something to work on (letting the littles help) while their younger sibs explored some of the other stations. I also put out the felt pieces and let kids explore with those. They love sticking them on the felt board and taking them off again. This was our last Preschool Lab of the summer. It's been really fun doing it every week and I finally feel like I'm at the point where I'm not extremely nervous before these science programs. For the fall, we'll go back to rotating our Preschool Explorers program between Preschool Lab, Wee Dance, and a more traditional storytime + playtime. I'll still be doing Preschool Lab, but typically once a month instead of every week! It was definitely a challenge for me to plan a Preschool Lab every week this summer, but it was a fun challenge and I'm feeling much more confident about this program, so I'm excited to see what we'll get into this fall. Coming soon: a post debriefing Preschool Lab and how everything went this summer! It's always good to take some time to look back over how things went, think about how things can be improved, and make note of what worked well.